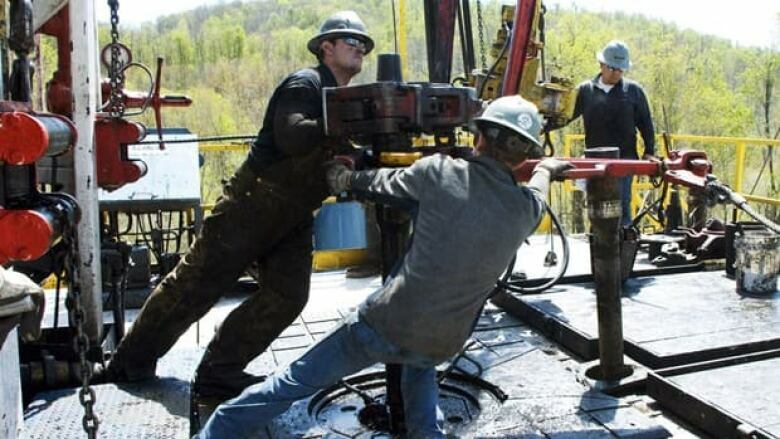 An oil and gas industry group is scaling back its drilling activity forecast for 2012, in part because there aren't enough workers who have the know-how necessary to drill big, complicated wells. The oil and gas drilling industry may need to fill as many as 130,000 new position by the end of the decade. "There are rigs and equipment racked because the companies can't crew them with skilled workers," said Mark Salkeld, president and CEO of the Petroleum Services Association of Canada. PSAC said Monday it expects 13,350 wells to be drilled in Canada this year, an 11 per cent decrease from its November forecast. The group decided to rethink its 2012 forecast when the actual well count for 2011 came in 783 wells lower than what it had called for as recently as November. One reason for the miss, Salkeld said, is a big shift taking place in the industry toward unconventional oil and gas drilling. Instead of drilling a vertical well a few hundred metres into the earth — as has traditionally been the case — companies are now drilling far-reaching horizontal wells thousands of metres underground to tap into prolific, but tough to access, reservoirs. "We may be drilling fewer wells, but the wells themselves are taking longer to drill. They're more complex," said Salkeld, who said PSAC intends to take those changing dynamics into account in future industry forecasts. Drilling those types of wells takes a certain skillset that's better acquired in the field than in a classroom — and that makes finding capable workers difficult, Salkeld added. "You don't just get somebody off the street to directional drill." The Petroleum Human Resources Council estimates some 39,000 workers will be needed to replace those who are expected to retire before 2020 — and that's just to maintain the status quo. Factoring in a more bullish outlook for natural gas and oil prices, the council said the industry could need as many as 130,000 new hires by the end of the decade. "Those numbers are just mind-boggling," said Salkeld. He said industry is working with schools and communities to attract more workers, and with governments to make it easier to tap into labour pools outside of Alberta. Aside from the labour crunch, low natural gas prices and a warmer-than-usual winter also caused PSAC to revise its outlook. Alberta natural gas prices are expected to average a dismal $3.25 per 1,000 cubic feet this year, which makes it tough to break even in many reservoirs. Winter is typically the busiest time of year for oil and gas drillers, since the ground is frozen solid and heavy equipment can move around easily. Balmy weather has made conditions too muddy and soft for drillers to work in some places.